So, this past Sunday.. Hia, & I got together with a few of our gal pals, and had a fun-filled, heart-to-heart creative Sunday. We ate, we drank, and we created. With the start of a new year, it’s essential to set goals in order to be successful. 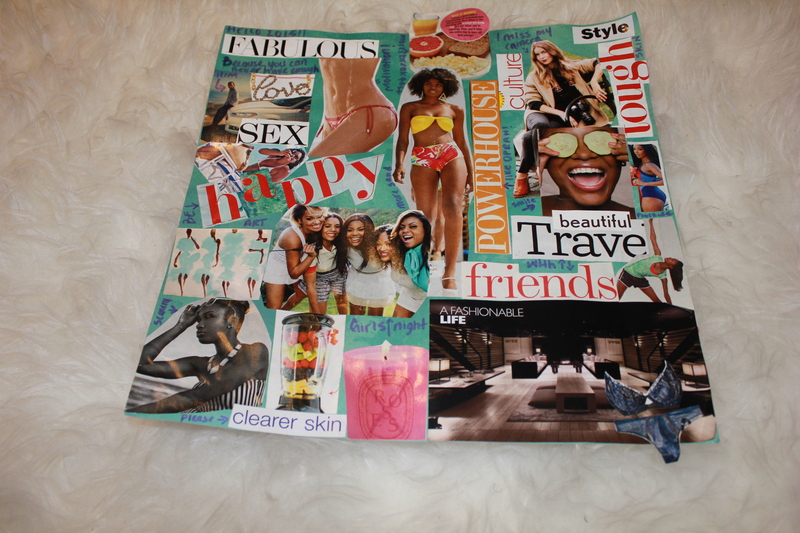 So with that said, we made vision boards. (Sidebar: Guys can make vision boards too). To catch those of you who are not sure what a vision board is up to speed. 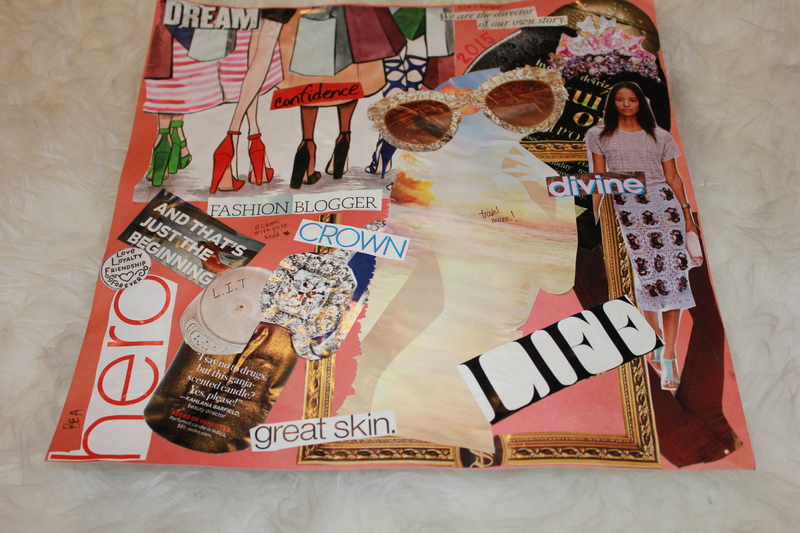 A vision board is where you can display images that represent whatever you wish to be or do in life. It feels great to wake up to a visually stimulating collage of purpose on your wall that reminds you of how awesome life is and will become as long as you stay on your grind. Now, you may wonder what’s the point in creating one of these. Well, besides the fact that it’s so much fun. As humans, we have so much going on, and it is very easy to get distracted or sidetracked, that sometimes there’s a need for a constant reminder of the things we should or shouldn’t be doing to get to the places we wish to be. So it’s pretty simple, all you’ll need is some friends (I mean, you could do it alone, but why? ), poster, markers, old magazines/newspapers, scissors, glue/tape, and a bottle of wine.. ok ok, maybe the wine isn’t mandatory. LOL. Start flipping through the magazines/newspapers and whatever images or words jump out at you, (vacation pics, quotes, careers, etc) cut them out, once you’ve scanned through all of them, now comes the fun part, glue and paste. Once all of your pics have been placed, and have dried, proceed to write yourself little notes, or words of encouragement with the markers. And then voila, you’re done. Hang your vision board some where you’ll see it once you wake up, mine is hung right next to my bed! 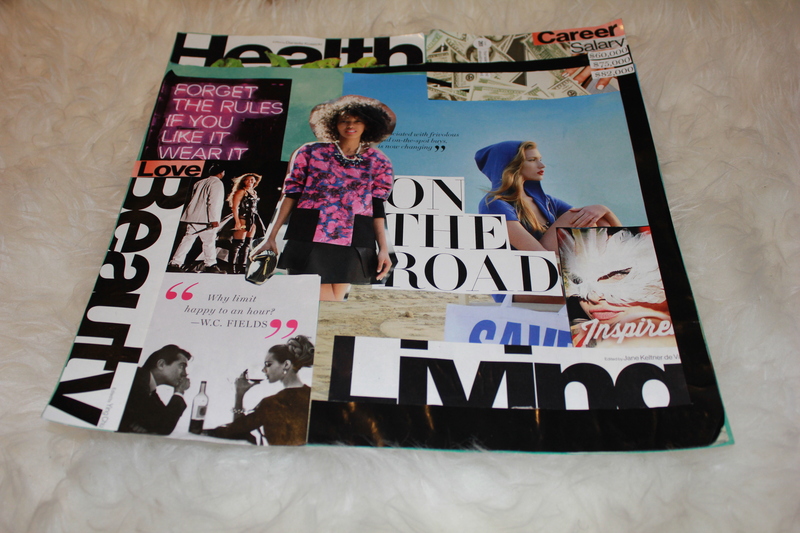 Check out our vision boards below, and tell us what you think! ← Letter From The Editors!